Products will always fail. What makes or breaks a company is how they respond to the problem. It’s now easier than ever to turn up the heat on an unresponsive company. As a consumer reporter for years, consumers called me when companies ignored problems. Use social media to your advantage to get results. We live in an instant gratification society. That feeling is vitally important when we have a problem. Consumers get fired up when there’s a problem with a product. You didn’t get what you paid for, the product failed or damaged your property. Social media is a powerful tool you should use when they need to grab a company’s attention quickly. Look at any large company’s Facebook or Twitter feed, and you’ll see posts about customer satisfaction. Some companies respond. Others try to ignore the posts. The larger companies are learning quickly they need a dedicated person responding to social media. Make the complaint on the company’s Facebook wall. Don’t respond to someone else’s comment. Typically, the company responds to a social media complaint and asks you to direct message specific details or contact information. If the off-line conversation doesn’t solve your issue, get back on social media and report the inaction of the company. Don’t let the company hide behind direct messages to make it look like they are fixing your issue if they really don’t fix it. If they do solve it, report that too. Airlines are quick to respond on Twitter. It’s a great tool to use if you are stuck at the airport due to a flight delay and don’t want to stand in line or on the phone on hold. Many times the airline re-routes your flight quickly with social media. I’ve used Twitter multiple times when flying. What used to take 1.5 on the phone or in line, now takes 20 to 30 minutes on Twitter to resolve. Companies want to appear as though they are fixing problems. That’s why most are quick to respond on social media. If you post a complaint on your social media page, tag the company. That will grab their attention. I’ve seen it work over and over again. What if there’s no response to your social media complaint? There are some caveats. Companies are not quick to respond on weekends or after hours. Try to Tweet during business hours, if it’s a problem that can wait. If a company doesn’t respond immediately, Tweet them again. Mention in that secondary Tweet you are still waiting for a response. Some companies erase consumer complaints, especially on Facebook pages. If that happens, keep complaining. For years, some Kenmore grillers have reported holes in their grills. Many frustrated customers have turned to social media to complain. The success is mixed. The firebox which collects the grease and food drippings rusts and pits. Huge holes develop exposing the flame to the propane tank. The covers for the burners also rust and flake off. Most of the complaints involve grills that are just out of warranty or only a few years old. The rust problem is hidden beneath the burner. Many grillers told me they never noticed it until our story or until they changed the propane tank and saw chunks of their firebox that flaked off and fell to the bottom of the grill. After I brought the issue to Sears in 2014, the retailer agreed to repair five Kenmore model grills. These include 16154, 34176, 34178, 34308, and 23683. Here’s the problem. Other grillers are having the same problem even though their model number is not in the free repair. Sears denies there is a repair issue saying the complaints are low. Those stuck without a repair use social media to let Sears know how they really feel. Drivers took to social media over melting dashboard issues. The sun reflects off the melting dash and creates a terrible glare. Drivers shared photos where you can’t see children crossing the street up ahead because the glare blocks them. After I got involved and began tagging the manufacturers, they began responding to complaints directly on my Facebook page. Nothing was done until I repeatedly pushed the manufacturers to do something. We tagged the manufacturers in social media posts and had others share their photos. 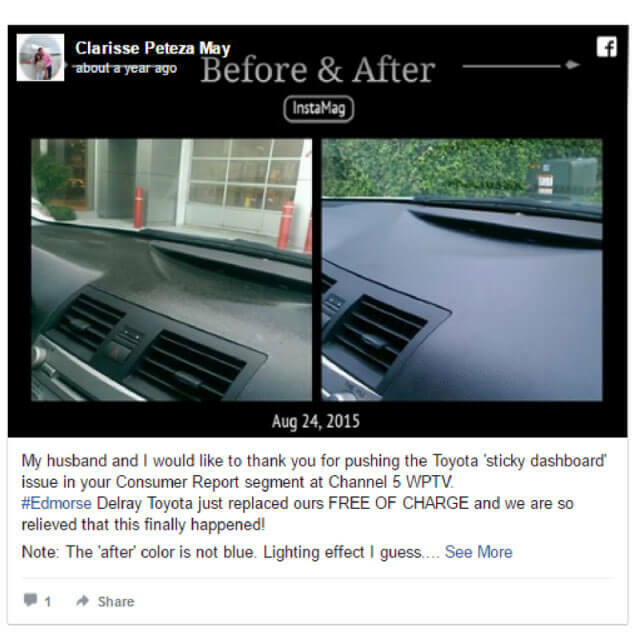 Eventually, Toyota/Lexus stepped up and did the right thing repairing the dashboards. While the repairs are ongoing and slow-going, at least they’ve committed to the repairs. Months later, Mazda stepped up too. Then Subaru. Slowly the carmakers are doing the right thing. Nearly five million dashboards will now be replaced. 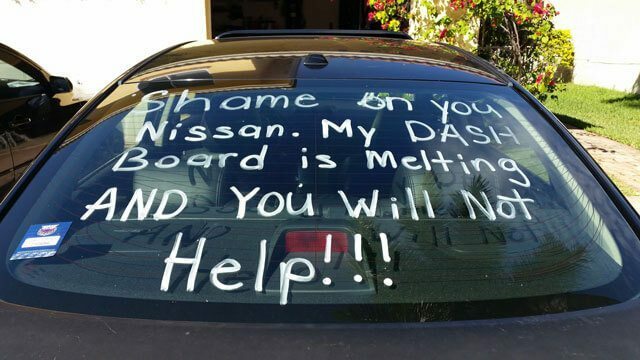 No driver expects their dashboard will melt in the sun, yet Nissan still hasn’t agreed to widespread repairs. Nissan is handling the issue on a case by case basis. Some drivers tell me they’ve gotten free repairs and others are denied. I’m hopeful through the continued pressure or legal action Nissan will eventually step up and do the right thing too. So what can you do if you have a product, and the company won’t fix it. Be vocal. Take a look at the message one Nissan driver put on his back windshield. Nissan may never see it but other drivers will and word of mouth impacts decisions consumers make. I truly believe the carmakers who did the right thing in repairing the melting dashboards would not have taken any steps without the continued public pressure. Social media gives you a direct path to voice your frustration. Also, report the problems to government agencies. For dashboards, that’s the National Highway Traffic Safety Administration. 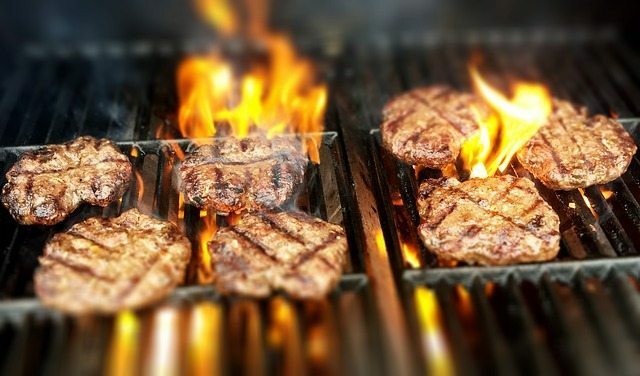 For the grills, show pictures to the Consumer Product Safety Commission. When I searched the government database, there were very few complaints about the Kenmore issue. Often consumers don’t take this extra step and it’s so important. The government looks at your complaints to track trends and potential safety issues. Kenmore grills are manufactured to our brand’s high standards for quality and the Kenmore brand places the highest priority on the safety of our products and those who use them. In fact, a leading consumer magazine recently placed Kenmore models in 4 of the top 5 spots within its large grill ratings based on an evaluation that includes consumer feedback with respect to reliability. We are confident, and our experience and low incidence of service requests supports, that Kenmore grills are not repair-prone. We are confident that the vast majority of Kenmore grill owners have not experienced any service issue. Regardless, Kenmore strives constantly to improve the features and quality of its grills, and our newest models offer the highest level of performance and reliability. We continue to offer to replace firebox trays on a limited number of Kenmore grills. Sears and the Kenmore brand are providing a complete firebox tray replacement only for the following affected grill models: 16154, 34176, 34178, 34308 and 23683. Both the firebox tray kit and installation are provided at no charge to the customer. Any other complaints regarding any brand of grill purchased at Sears will be handled through our normal customer care process, on a case-by-case basis and in some cases require a service charge. An overwhelming majority of our members/customers are satisfied with our Kenmore grills and for the relatively small percentage of those who have experienced an issue, we have taken steps to address their needs. If they have questions they should contact our customer care team at 1-800-4-MYHOME / (800) 469-4663.